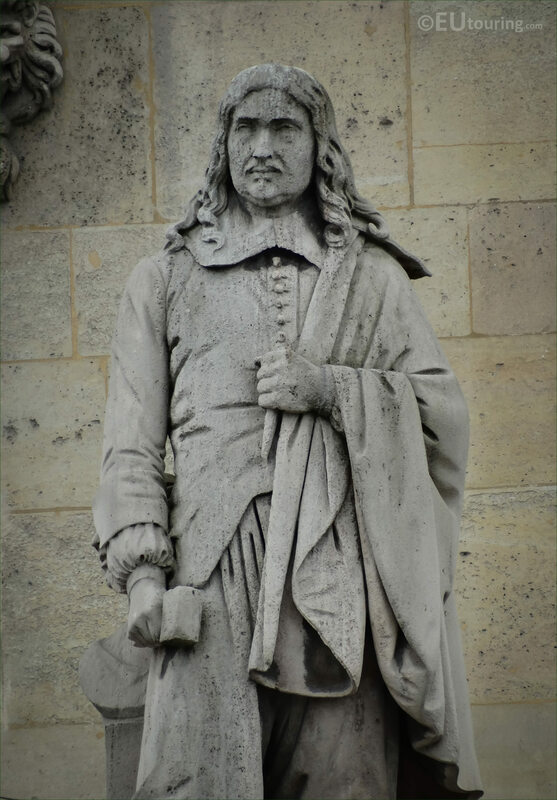 We were at the Musee du Louvre in the 1st Arrondissement of Paris within the courtyard called Cour Napoleon when we took these high definition photos of a statue of Jacques Sarazin, which was sculpted by Honore Husson. 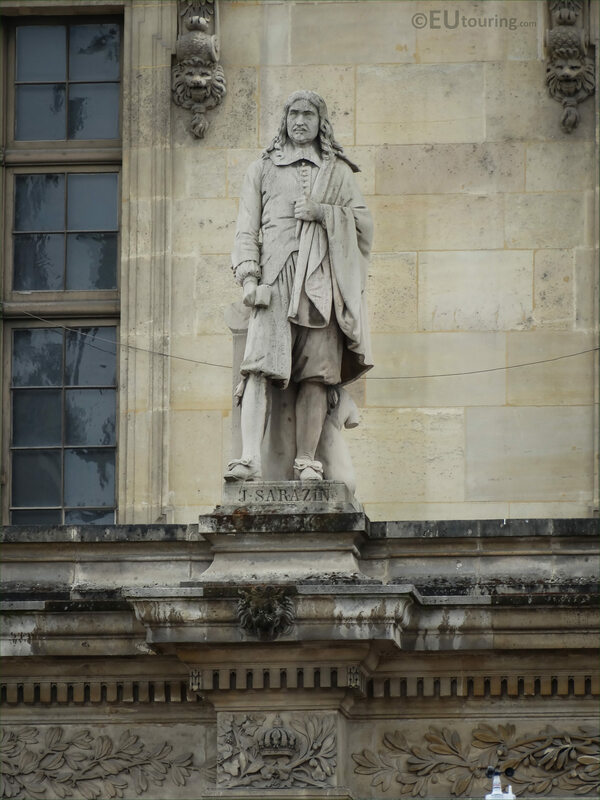 Now this first image shows that the statue of Sarazin is located on the first level balustrade of the facade called the Aile Mollien wing of the former Palais du Louvre, and this particular one is positioned virtually in the middle, or the fifth one from the left. So this photo showing the statue itself was sculpted by Honore Jean Aristide Husson who was born in Paris in July 1803, and becoming a French sculptor he won the Prix de Rome in 1830 and spent almost five years at the Viilla Medici in Rome before returning to Paris where he received numerous commissions from the French State and the City of Paris prior to passing away in July 1864. 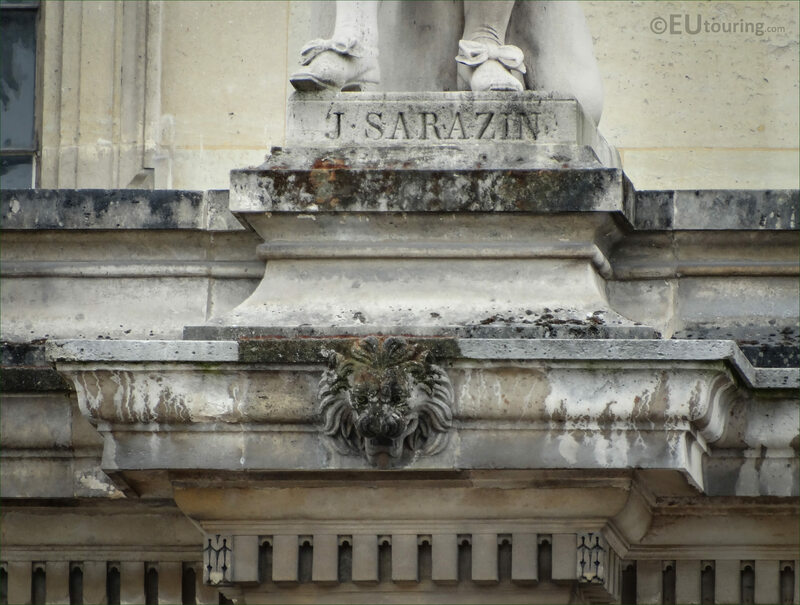 And this last close up photo shows the plaque at the base of the statue dedicated to Jacques Sarazin, which is sometimes spelt Sarrazin, and born in the late 1500s he became a French sculptor himself, spending some time in Rome before returning to Paris and receiving numerous commissions, with his early successes being noticed by the minister to King Louis XIII. So the minister entrusted him with what has become his best known work, which was the decoration of the great portal and the dome of the western facade of the interior court of the Louvre, yet Jacques Sarazin passed away in December 1660 before his last project was completed, which was the mausoleum for the heart of the Prince de Conde, and this was finished by one of his pupils.